More than 400 million devices are running Windows 10 around the world. The number might have increased now and as people keep on downloading and experimenting with Windows 10, a lot of them have come across a similar recurring problem. The problem is related to sound. A number of users are facing sound not working with the latest Windows 10 builds. 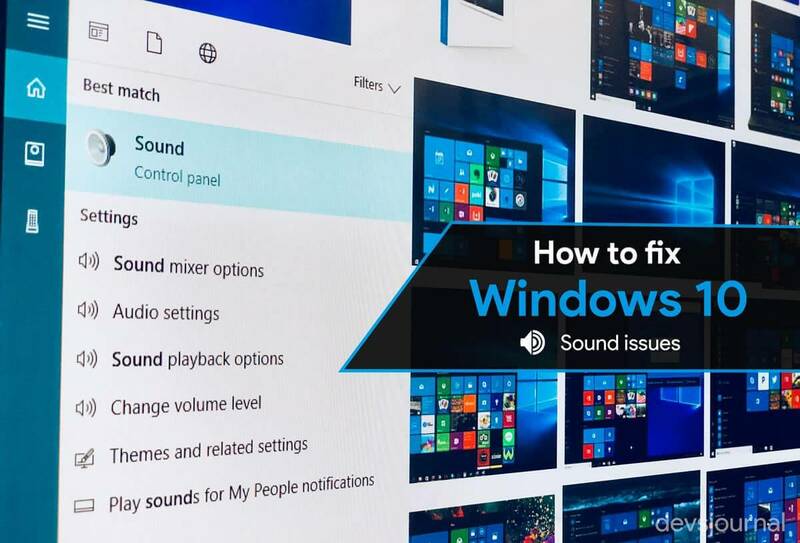 If you too are facing audio issues on Windows 10 such as audio/sound not working properly, out of sync audio or no sound at all then you are at the right place. In this article, I will be explaining different methods which you can use to troubleshoot the audio issues. The methods are fairly simple and you do not need to be an expert to implement them. Just work your way down from the first method and find the one which works for you. This way you won’t have to try all of them. Before we jump on to the methods which basically deal with computer software, please make sure that you rule out any possible human error. Check your volume controls and make sure that it is not muted. Check if your headphones are plugged in and the volume is turned up. Once you rule out all the possible human errors and the problem still persists, you can start implementing the methods given below. There is a pretty good chance that one of them will solve your audio issues. Just work your way from the first method to the last. There is a pretty good chance that you might have messed up with the cables. Make sure that all the connections are right and there are no loose or damaged cables. After confirming that the cables are connected properly, try checking your volume controls, un-mute it if its muted and slide the volume bar all the way up to increase the volume. There is a high probability that you are using an outdated or faulty sound driver. This could be the primary reason behind why you are having audio issues. You can update your sound drive manually or automatically. 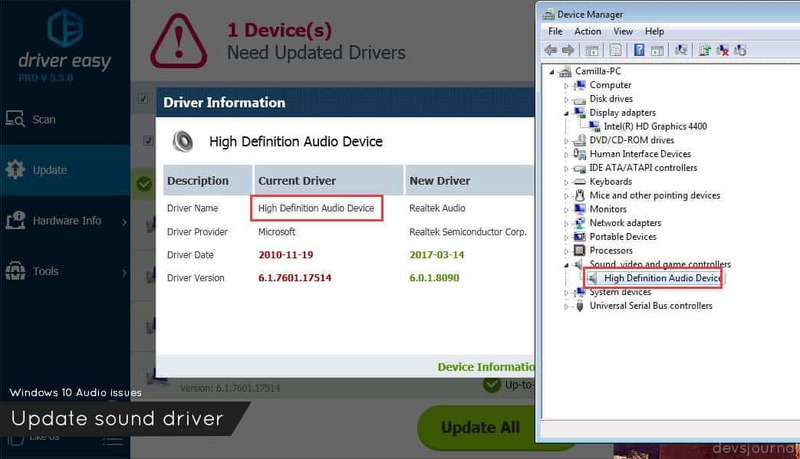 Updating driver manually: To update your sound driver manually, you need to go to your sound card manufacturer website and search for the latest driver. Download the driver which is compatible with Windows 10 operating system. If you’re facing any not responding issues, you can check our fix for Windows 10 freezing issues. Updating driver automatically: To update your driver automatically, you will need to take help of third-party applications which will scan your desktop computer and search for the latest drivers. The software will check and find drivers for your exact sound card. SlimDrivers is by far one of the best application to update your drivers automatically. It automatically scans and recognizes your system and finds the latest updated drivers for your system. You can download Driver Easy from here. Run the software and click the Scan Now button. Click on the Download Update button which is next to your sound card and it will automatically download and install the latest driver for you. and that’s it. This will replace your faulty or outdated sound driver with the latest one. Also Read: Top 20 best Windows Rainmeter skins to transform your device. Sometimes, you need to choose the correct audio playback to fix the audio issues. To choose the correct audio playback, you need to go to the Control Panel and enter Sound. Now in the Playback tab, right-click on your speakers and select properties. A new window will pop-up. Under the Advanced tab, you will find a setting named default format, change the setting and click on the Test button. Keep changing the setting until you get sound from your speakers. If you are still not able to fix your audio issues by changing the default format setting, then you can try disabling the sound effects and see if it fixes the issue. To disable sound effects you just need to go back to the properties of your sound device and click on Enhancements tab. Tick the dialog box where it says Disable all sound effects. A faulty sound driver running on your system might be causing audio issues. The only way to fix this is by uninstalling the faulty sound driver. To do that, follow the steps below. #1. Press the Windows and X key simultaneously on your keyboard. #3. Click on Sound, video and game controllers and expand it. #4. Look for your sound card driver, right-click on it and choose the Uninstall option. #6. Restart your computer after the uninstall process is completed. 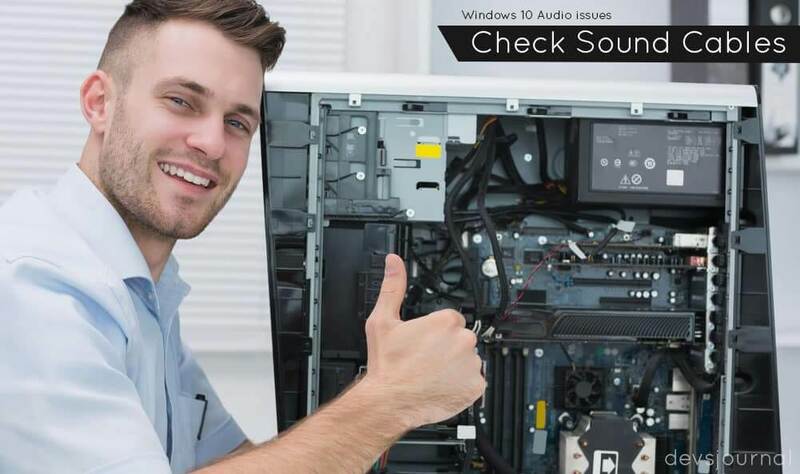 The audio issues on your system should be fixed by now if they were caused due to a faulty sound driver. If you are still having issues, you can try the next method which has a high success rate of fixing the issues. #4. 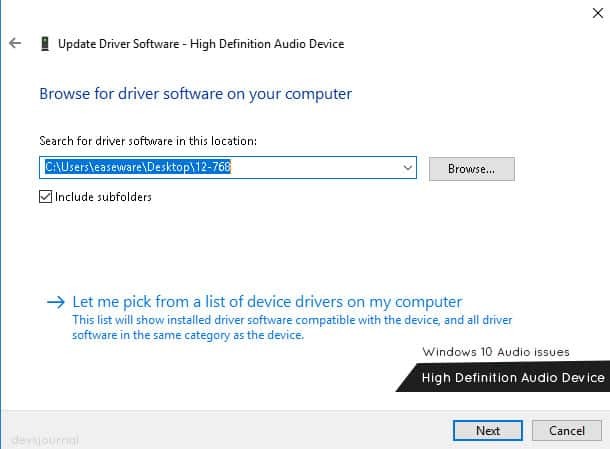 Look for your sound card driver, right-click on it and click on Update Driver Software option. and that’s it! Wait for the installation to complete and restart your computer. 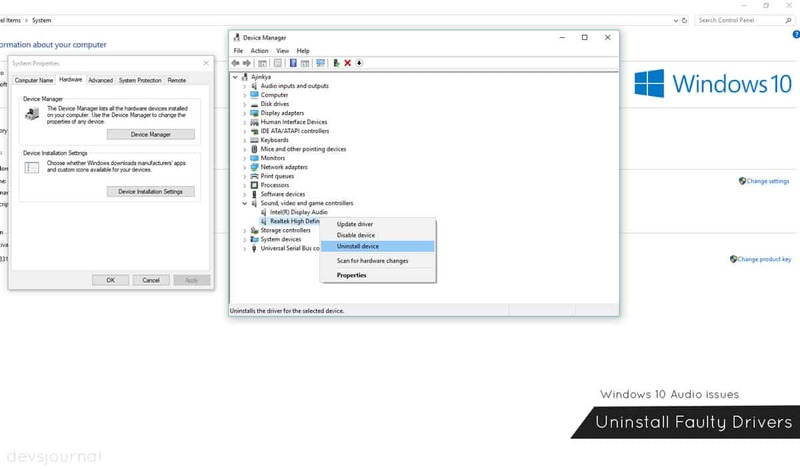 This should fix all the sound issues on your Windows 10 OS. The methods mentioned throughout the article have very high odds of fixing your audio issues. If you are still having audio issues despite implementing all the methods, you should try showing it to an expert. You might be having a faulty hardware. An expert can easily spot it and fix the issue. Also, try to frequently update your Windows 10 OS, Microsoft keeps releasing updates to enhance the functionality of the OS.